Manish Malhotra, MBA, is Founder, President & CEO of Income Discovery, which is an optimizing software for retirement income strategies. 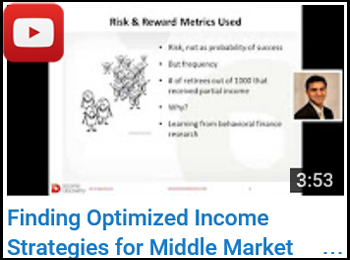 for Middle Market Clients . Manish holds an MBA from Xavier School of Management (XLRI), and an engineering degree from Indian Institute of Technology (IIT) Khargapur, top colleges in India. 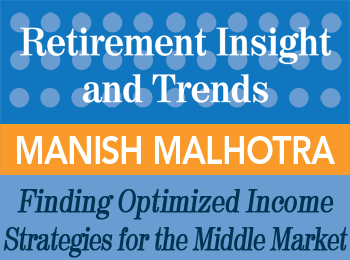 Read a summary transcript of Manish Malhotra’s presentation Finding Optimized Income Strategies for Middle Market Clients in the 3rd / 4th Qtr 2014 issue of “Retirement Insight and Trends”. Manish Malhotra is a well-known MarketWatch RetireMentor. You can read his column here. In a landmark 2012 Journal of Financial Planning paper titled A Framework for finding an Appropriate Retirement Income Strategy, Manish proposed a new risk-reward framework for analyzing retirement income strategies, which is used in concert with Income Discovery to find strategies that provide higher retirement income at less risk. Have Manish Malhotra speak at your event! Manish Malhotra is one of many experienced speakers and keynote presenters on a variety of topics for your retirement professional development group. Please contact us today via email or phone 847-686-0440 x102 if you would like to have Manish Malhotra present at your conference or appear at one of your events, or to receive a free voucher to view a sample of one of our speaker’s work. Learn more about Manish Malhotra’s Income Discovery. Find courses and products from Manish Malhotra at the Retirement Resource Center.